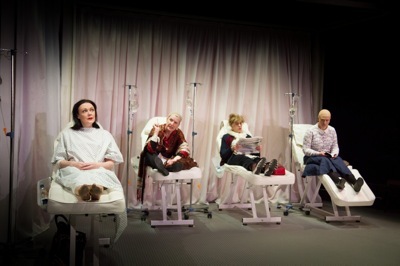 Happy Ending – a play about cancer and death. With added songs. At first glance the white reclining chairs on stage at the Arcola theatre could be sun loungers around a Mediterranean pool. However on closer inspection instead of towels and cocktails there are trolleys of drugs and disposable gloves. Happy Ending is not set in paradise but in a cancer ward. Adapted from the award-winning play by Anat Gov – who died in 2012 – it tackles subjects most people prefer not to consider. An evening with death and cancer sounds like something to miss, but it is an attempt to examine the ways we use to make life bearable in unbearable situations. If you have tendencies to hypochondria you’ll leave in a terrible panic. Three cancer patients spend most of the play sitting on chairs receiving chemotherapy. They represent types of people – the cynic, the believer and the new-age fanatic. As they interact with each other we see their different approaches to coping with illness. Sarah (Thea Beyleveld) is religious, training to become a Rabbinical judge. She accepts cancer as part of God’s plan for her life, realises that everything that may happen is God Willing. Silvia (Andrea Miller), older and more cynical stands for the patient who refuses to give in, who fights the cancer with sheer strength of personality. Miki (Karen Archer) is the new-age hippie, desperately trying any nonsensical cure that is suggested in her Herbal Health magazine (horse milk anyone?). The women take turns to reveal bits of their lives, but it is their attitudes that are important to Gov. They talk, but even in hospital they are all still trying to avoid mentioning death. In this way they have made a relatively happy, positive atmosphere. But the arrival of Carrie (Gillian Kirkpatrick), a new patient with stage 4 cancer (that’s bad, there is no stage 5) changes things. She is confused, unhappy, and forces the others to reconsider their coping mechanisms. Based on her personal experiences of living with cancer, Gov’s play was originally written in Hebrew. This English translation retains some of the Jewish setting, with Sarah aiming to become a rabbinical judge and Silvia disclosing her connection to a concentration camp. The Jewish authorship also explains the inclusion of a joke comparing the cancer ward to Auschwitz which would have been harder for a non-Jewish playwright to include. Dr Lynch is a pragmatic foil to the patients, giving the facts and figures for the women to consider. Oliver Stoney reveals this fierce medic’s gentler side and shows something of the conundrums and difficulties doctors face everyday. What is the right way to approach cancer, illness and death? Is trying to be cured even the right aim? Is the prolonged life worth the treatment? These questions and more are raised and left for the audience to ponder and debate on the way home. The play is billed as a musical comedy. I take issue with that description. There are songs, but only a few and they and their dance routines add little to the entertainment and feel tacked on. Humour is not a strong point and the few laughs are mainly supposed to come from Sylvia’s pointed comments. Rather than a musical comedy it is better seen as an illustrated debate on dealing with cancer. It is good to see fringe theatre tackling such difficult topics.